The Start date field mapping must be configured in the TimelineJS format settings before any slides or eras can be rendered. ​This annual report celebrates our 15th anniversary by sharing with you stories from some of the people whose lives have changed as a result of our work. Knowledge is invaluable — to both people and the development of society. EIFL works with libraries to enable access to knowledge for education, learning, research and sustainable community development. 1999 as a project of the Open Society Institute (now the Open Society Foundations), the world was undergoing tremendous change. As post-Soviet bloc countries began to open up, researchers and the academic community were hungry for up-to-date information. At the same time the internet was gaining momentum, presenting an incredible opportunity to bridge the information gap. It was in this environment that EIFL began to negotiate with publishers for affordable access to online journals for academic and research libraries in Central and Eastern Europe. However, many publishers continued to charge high subscription fees for important journals, and knowledge remained unaffordable and unattainable for scholars in developing and transition economy countries.We realized that we needed to do more to address the issue of affordability. In 2002, EIFL joined an international meeting of eminent scientists and academics in Budapest. This meeting resulted in a worldwide campaign for open access to all new peer-reviewed research. EIFL’s contribution to furthering the open access movement through advocacy and mobilization of the EIFL network fills me with considerable pride.Today, as a result of EIFL’s work, there are over 4,000 open access journals and over 700 open access repositories in our partner countries. Researchers and scholars everywhere — in both developing and developed countries — are benefiting from open access content, and the idea of open access has gained acceptance all over the world. I am also particularly proud of our persistence in tackling legal barriers to access and use of digital content by advocating for fair national copyright laws. We have made considerable gains in nine EIFL partner countries. In 2013, we welcomed the adoption of a new international treaty, the Marrakesh Treaty, which facilitates access to published works by blind, visually impaired and otherwise print-disabled people.EIFL is now supporting ratification of the Marrakesh Treaty in our partner countries and its implementation into national copyright law. We continue to press the World Intellectual Property Organization (WIPO) for an international copyright treaty for the benefit of libraries and all the people who use them. As the internet expanded to reach more places, we started working with public and community libraries, encouraging them to introduce technology into their services. of farmers, jobseekers, vulnerable children and youth, women, health workers and their patients, disabled and socially excluded people. Our work now reaches over 60 countries in Africa, Asia, Europe and Latin America. Last year, we were pleased to welcome Myanmar to the EIFL network. For the first time, five major universities in Myanmar now have online access to international journals, databases, and e-books through the EIFL elibrary Myanmar project. 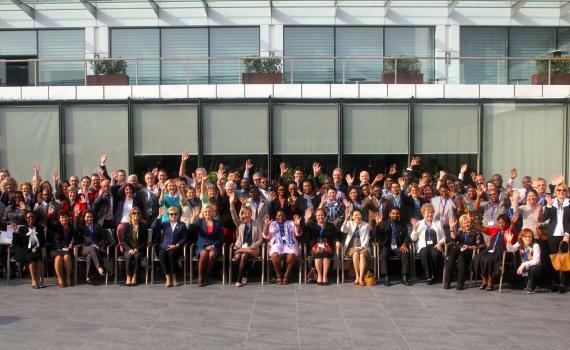 None of this would have been possible without the support of our board members; the hard work of our committed and enthusiastic staff team, and the many dedicated librarians who take forward the work of our programmes in our partner countries. Knowledge is invaluable – to both people and the development of society. When EIFL was founded 15 years ago, the internet was gaining momentum, presenting an incredible opportunity to bridge the information gap. In 2014, EIFL reached over 14,000,000 people. In 2014, EIFL reached over 2,200 universities, colleges and research institutions. In 2014, EIFL reached over 1,000 public libraries. 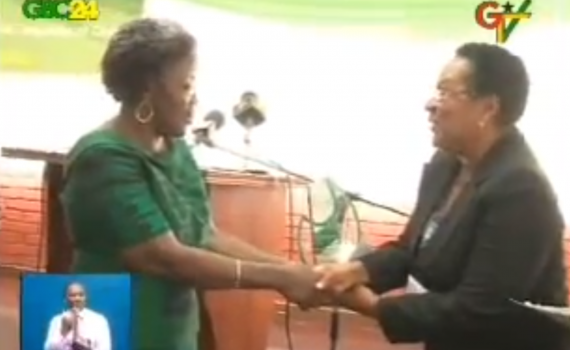 Helena Asamoah Hassan (right), former member of the EIFL Advisory Board and former Chairperson of CARLIGH shaking hands with the Second Lady of Ghana (left) at the Consortium of Academic and Research Libraries in Ghana international conference. EIFL-partner library consortia in three countries – Ghana, Kenya, Zambia commemorated their 10th anniversary in 2014. The startup was thorny, and there were many common challenges to building effective consortia all these years ago. Some of the issues back then included recruitment and retention of active members, establishing good governance, developing the ICT competencies of librarians and ensuring the continued availability of e-resources and good connectivity. Dr. Joel Sam, EIFL Country Coordinator for Ghana, says that one of CARLIGH’s major achievements includes the acquisition of land in Ghana to build consortium offices, conference facilities and a hostel to continue their work. Equally important was developing fruitful relationships with stakeholders: advocating for adequate library budgets, building the digital skills of users, raising awareness of the importance of open access and copyright amongst decision makers and academia. Over the past ten years there have also been many major accomplishments. “Our major accomplishment in ten years was the acquisition of land to build consortium offices, conference facilities and a hostel,” explains Dr. Joel Sam, EIFL Country Coordinator for Ghana, at the First International Conference to celebrate the 10th anniversary of CARLIGH, the Consortium of Academic and Research Libraries in Ghana. According to Sam, creating this base for financial sustainability was made possible by the wise investment of internally generated funds over the years. “The consortium has formulated a two-year strategic plan to run from 2012-2014. Its vision is to provide a leading platform for information sharing in Zambia and world over,” says Chitumbo. Eness Chitumbo, the Zambia Country Coordinator, says that her library consortium has created a strategic plan that is moving forward on issues of consortium expansion and the promotion of the use of free and open source software, e-resources and open access. Through effective advocacy and promotion, all three consortia have experienced substantial growth in the number of active member libraries and e-resource’ subscriptions. These last ten years have also seen the creation of an impressive range of open access repositories, making indigenous research output visible to the world. The consortia have enhanced the visibility of libraries through joint advocacy activities, and support professional advancement by providing a framework for knowledge sharing and capacity building. There is no shortage of lessons’ learnt - important knowledge that the consortium coordinators shared willingly at the 2014 General Assembly in Istanbul: ‘Involve the stakeholders, find your champions, repackage and share information’ is recommended by KLISC; ‘target government officials and new higher learning institutions’ suggests ZALICO; ‘adopt openness and equality as principles for consortium governance’ is the advice of CARLIGH. “From a humble beginning of six members in 2004 to a membership of over 30 now has been a lot of hard work,” she says. Growing from a humble beginning of six members in 2004 to a membership of over 30 now has been a lot of hard work says Dr. Helena Assamoah-Hassan, chairperson of AfLIA, the African Library and Information Association and former Ghana EIFL Country Coordinator. “Some of us had to use our personal financial resources for initial services and a lot of our energies and time to see it grow healthily,” she continued. “I remember when I combined the roles of Chairperson and Treasurer to have a firm grip on the financial strings. It has yielded fruit and now we have investments and at least one year reserve of funds for e-resources subscription,” she says. Participants from China, Fiji and the Maldives listen closely during one of the EIFL GA Trends to Watch sessions. In recognition of the success of the Zambia Library Consortium (ZALICO), Eness Chitumbo, Country and Licensing Coordinator for Zambia (middle), was awarded a Kindle, which was kindly donated by Royal Society Publishing. Marika Meltsas, EIFL Country Coordinator and Licensing Coordinator in Estonia (right) celebrates EIFL’s 15th anniversary with Karmen Sotosek (left) EIFL Country Coordinator in Slovenia. 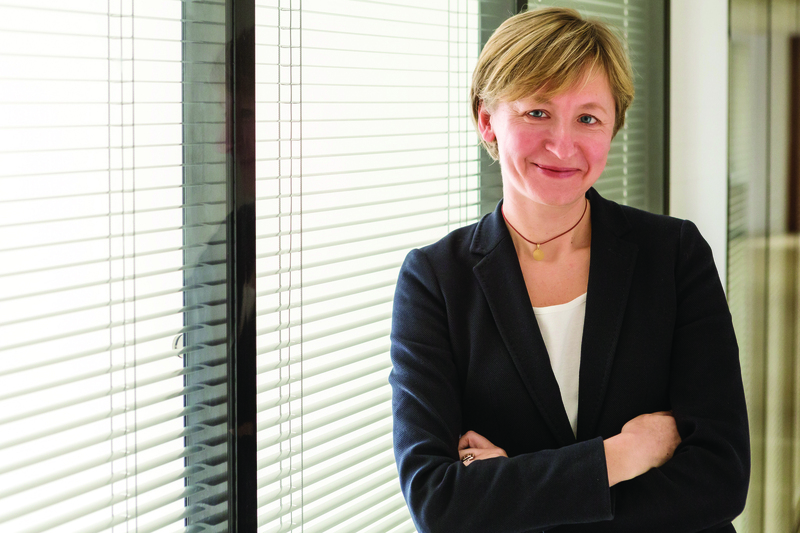 Marika was involved in EIFL's first negotiations with publishers team.“At the time, countries like Estonia had almost no budget for libraries, and many other smaller countries had no purchasing power with publishers," she says. "So it was very important to have help from EIFL in building a library consortium who could negotiate for very low prices to help them start with even some resources,” she says. Arnold Hirshon, EIFL's Management Board member, presents at the EIFL GA. For Hirshon, being able to both witness and be involved in EIFL’s growth over the past 15 years has been incredibly rewarding.In those early days, he worked with Monika Elbert, now EIFL’s Senior Policy Advisory, helping countries to build their library consortia. Enter the University of Mandalay Library on any given day and you will find Durga Daewi, a second-year Masters of Law student, in front of a computer busily preparing for her thesis. For millions of university students around the world using the internet to study and having access to high quality e-journals and e-books are taken for granted. But for Durga Daewi and thousands of other students in Myanmar, it has been a revelation. “In the past, printed textbooks were difficult to find. And if you did manage to find one, it was very expensive,” Durga Daewi explains. Thanks to a new e-library at the University of Mandalay, Durga Daewi can now access the texts she needs online. The e-library, comprising more than 10,000 full-text scholarly journals and 130,000 full- text academic e-books, is a central component of the EIFL eLibrary Myanmar project. a fundamental difference to the lives of students, researchers and academics. The launch of the EIFL eLibrary Myanmar project could not have been more timely. 1988 at the University of Mandalay and the University of Yangon. In December 2013, they were at last allowed to reopen their doors to undergraduate students. The new students had high learning expectations that the universities were anxious to meet. The university library collections were limited, out of date, and many books were falling apart. Students shared a handful of donated computers and struggled with slow internet. Until the start of the project, no universities in Myanmar had access to online subscription resources. Professors were hard pressed to catch up with developments in their fields and had to resort to contacting universities abroad to ask for journal articles to be sent via email. The EIFL eLibrary Myanmar project set out to overcome these challenges by providing instant online access to a world-class collection of specially selected international journals, databases and e-books, and training students and librarians how to use them. learning across all faculties — from the social sciences and humanities to the sciences. The universities installed new fibre optic cables to increase internet bandwidth and purchased new computers. Demand for access to the e-resources was immediate. Impressed by the impact of the EIFL eLibrary Myanmar project at the University of Mandalay and the University of Yangon, three more universities invested in similar infrastructure and became partners in 2014: Dagon University, Yadanabon University and the Yangon University of Economics. Professors say the impact of the resources on teaching has been transformative. Professor Mi Mi Gyi, Head of the International Relations and Politics Department at the University of Mandalay, says she has already seen a marked improvement in her students’ work as a result of the availability of e-resources. “Now we are changing our education system from a teacher-centred approach to a student-centred approach. So, as teachers, we need to inspire the curiosity of our students,” she says. Myanmar is currently revising its old laws, and introducing many new laws. Dr Khin Mar Yee, Professor of Law at the University of Yangon, was invited by the Ministry of Science and Technology to help shape the country’s new draft laws on trademark, industrial design, patents and copyright. It is expected that the new draft copyright law will be sent to Parliament in 2015. To do her current work, Dr Khin Mar Yee relies heavily on the new e-library at the University of Yangon to stay up to date. “The law books we had were very difficult to buy and not sufficient for the many fields of law,” explains Dr Khin Mar Yee. For development to be sustainable in Myanmar, Dr Thaw Kaung, a former Chief Librarian at the University of Yangon, says universities will need to play a leading role. “We need educated people to run the country,” said Dr Thaw Kaung in a 2014 interview with The Associated Press. EIFL will continue to work with all five universities, and key priorities will include improving the dissemination of their research results through open access, to maximize the visibility, usage and impact of their research publications. EIFL will also provide assistance in the development of the new copyright law to better support university teaching and learning in the digital environment. In addition, EIFL will support the creation of a national library consortium to incorporate many of the country’s universities. By working together in a consortium, libraries can make more e-resources available to more people more cost effectively. According to Dr Kyaw Naing, Pro-Rector of the University of Yangon, the impact of the eLibrary Myanmar project on his university will be far reaching. “The establishment of the e-library at the University of Yangon is a significant development in our university’s history,” says Dr Kyaw Naing. Dr Thida Win, Pro-Rector of the University of Mandalay, agrees. “Having access to knowledge online has truly changed our university,” says Dr Thida Win. And for students such as Durga Daewi, on whom the direction of the country ultimately rests, the future looks hopeful. The 22-year-old hopes to use her newfound knowledge of the law to empower others. “My country is a developing country, so most of the citizens are uneducated,” she says. The eLibrary Myanmar project is funded by the Open Society Foundations’ Higher Education Support Program (HESP). Average discount negotiated in 2014. Estimated savings in 2014 (US dollars). 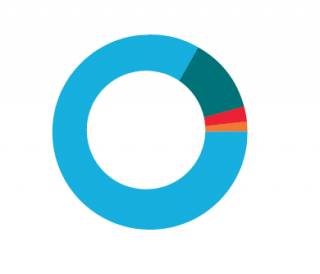 The number of full text downloads within the EIFL network in 2014. This annual report celebrates our 15th anniversary by sharing with you stories from some of the people whose lives have changed as a result of our work. 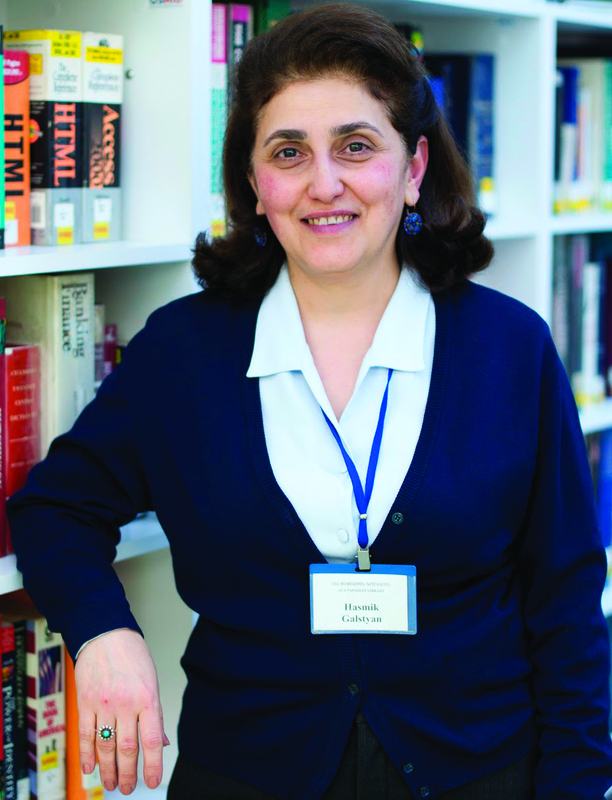 Hasmik Galystan, head of Reference and Circulation Services at Papazian Library, American University of Armenia, has been a librarian for 30 years. She has also served as the EIFL Copyright Coordinator for the Electronic Library Consortium of Armenia for the past nine years. Hasmik regularly encounters copyright restrictions that are a barrier to learning. For example, a student recently needed two chapters of a book that was not available in Armenia. Hasmik requested the material through the interlibrary document supply service, but the request was denied because the two chapters exceeded 20% of the book. With the support of the EIFL Copyright and Libraries Programme, Hasmik has become a passionate advocate for modern copyright laws that support libraries in serving the needs of their user communities. Through active engagement in the review process, she has made vital contributions to Armenia’s new draft copyright law. In December 2014, Hasmik attended the 29th session of the World Intellectual Property Organization’s (WIPO) Standing Committee on Copyright and Related Rights - the main body that shapes international copyright laws — for the first time as part of the EIFL delegation. She returned home from Geneva with new energy. Hasmik plans to continue her advocacy so that the new copyright law, when finally adopted by the National Assembly, does not deny students access to educational materials. In 2014: 11,490 people trained in copyright related topics across the EIFL network. I met many copyright experts in Geneva. I returned home with the knowledge that librarians can make a difference when copyright laws are being amended. The number of people trained across the EIFL network in 2012-2014. The number of languages the EIFL-IP Copyright for Librarians curriculum is available in (Spanish, English, Chinese, French, Russian, Polish, Arabic and Serbian). The number of activities and services included in proposals made by 58 member states of the World Intellectual Property Organization (WIPO) in support of libraries. 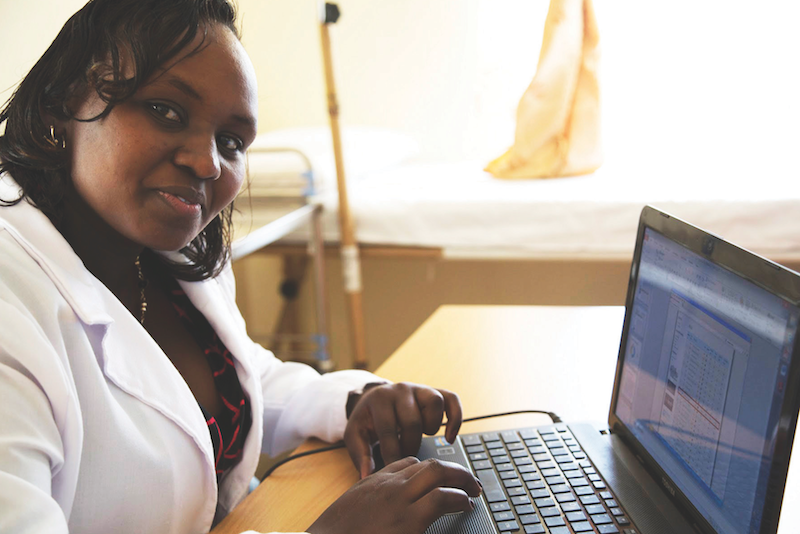 Bessie works as a general physician in Embu General Provincial Hospital in Kenya’s Eastern Province. The hospital serves a vast rural area that has only one doctor to every 10,000 people. Bessie struggles to access information. Distance and pressure of work mean her colleagues are not available to meet and share information about diagnoses, illnesses and treatments. Bessie became aware of open access — the immediate, online, free and unrestricted availability of peer-reviewed research literature — through a workshop supported by the EIFL Open Access Programme. The workshop was part of an EIFL project that educated researchers, students and health workers about new ways of sharing scholarly information. The workshop also raised awareness about open access to the Kenyan medical research. Bessie has now become a frequent user of open access literature to treat her patients. In the future, Bessie hopes to return to university to specialize in epidemiology, the study of how often diseases occur in different groups of people and why. To study in this field she will need to access research in many scientific disciplines such as biology, statistics, social sciences and even engineering. Bessie says she will continue her professional career in the Kenyan public healthcare sector, giving back to her community and the people of Embu. IN 2014: 67 more open access journals and 52 more open access repositories were launched in the EIFL network. The information is open and available, and you search for what you want. Open access is solving one of the biggest problems I’ve had. Roshan Kumar Karn is a medical student in his final year of study at Tribhuwan University in Kathmandu, Nepal. He wants to help people who are suffering from heart disease, and plans to specialize in interventional cardiology. But as he progressed in his studies, Roshan realized that the information he needed was not available in his textbooks. He began researching the internet for medical texts. He recalls the joy he felt when he found relevant abstracts, only to be disappointed when he was locked out by publisher paywalls. 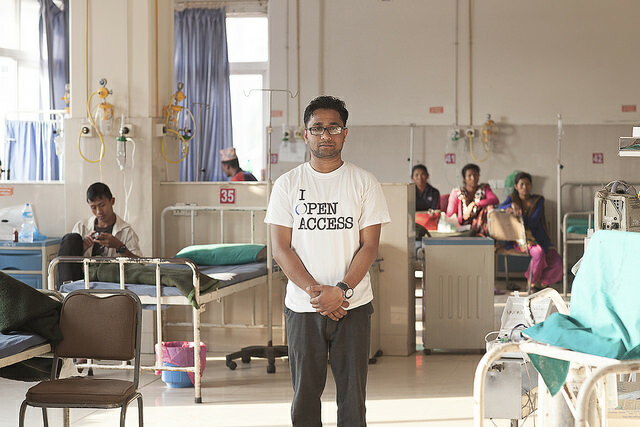 After learning about open access at an international conference, he launched Open Access Nepal, an organization that promotes free and unrestricted online access to research in his country. With support from the EIFL Open Access Programme, the new organization hosted its first conference during Open Access Week 2014. Roshan’s future plans include spreading awareness of open access at five major universities, building an institutional repository at Tribhuwan University to house its research online, and working with the Government of Nepal to digitize textbooks and turn them into open educational resources. IN 2014: 41,629 people trained in open access topics across the EIFL network. I see a bright future for open access in Nepal. This means a bright future for my country, because educational standards will rise when our students have better access to knowledge. 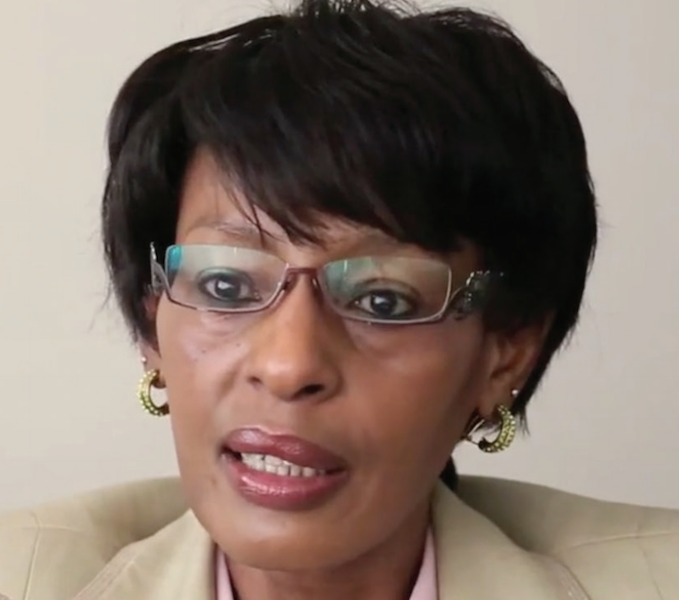 Professor Lucy W. Irungu is the Deputy Vice-Chancellor, Research, Production and Extension at the University of Nairobi, the largest university in Kenya. The university conducts important research in a variety of fields. However, much of this research was inaccessible to most Kenyans and the international community, because it was still being printed and placed on shelves. The EIFL Open Access Programme supported Professor Irungu and the university to develop an open access policy to ensure that research results are made freely available to all. To put the policy into practice, Professor Irungu worked closely with Rosemary Otando, a librarian at the University of Nairobi, and her team to launch an open access repository (an online database that houses all the research). The policy has been instrumental in helping the university to open up a wealth of knowledge from Kenyan researchers to the world. By the end of 2014 the digital repository contained over 70,000 documents. IN 2014: 22 more institutions adopted open access policies across the EIFL network. The research we do is supposed to be for the public good. We are being funded by public institutions and donors, and I think it is good to be able to share. People trained across the EIFL network in 2012- 2014. 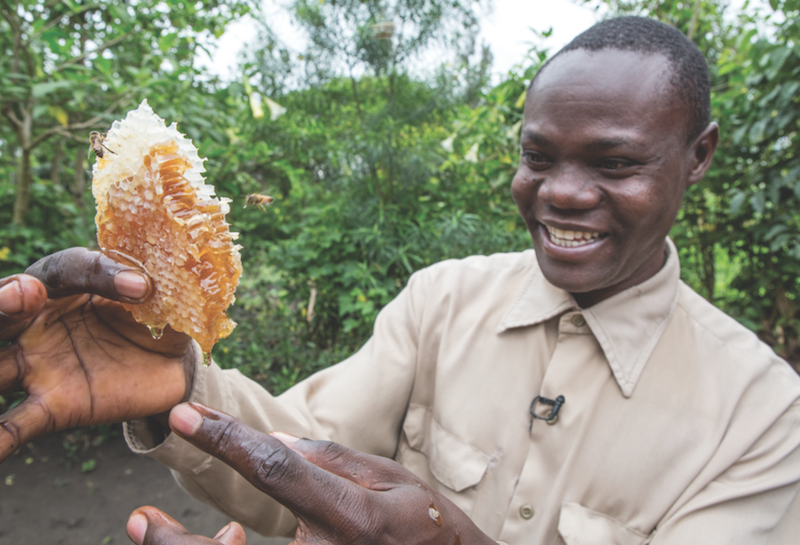 Alex Thabulenga is a beekeeper from Kasese District in western Uganda who manages 59 colonies of bees. He first used the internet at his local library, Bwera Information Centre. The library is one of five connected to the internet through an agricultural information and digital technology training programme for farmers supported by the EIFL Public Library Innovation Programme. Using information obtained online, Alex formed a collective with other beekeepers. They pooled their resources to buy a refractometer, and for the first time were able to accurately measure the moisture content in their honey. In just six months, the new beekeepers’ collective doubled their production of pure honey from one to two tons. Alex and other farmers are now committed to contributing to the cost of the library’s internet connection. Before we found information on the internet, we were harvesting one ton of honey. Now we are harvesting two tons of 95% pure honey. Zoran Miljkovic became a computer programming teacher because he wanted future generations to share his passion for digital technology. He has taught at a high school in Jagodina for over 14 years. But teaching was frustrating: firstly, the tight school schedule meant there was limited time in class for practical sessions, and secondly, the school did not have sufficient equipment to allow students to try out their computer programming theory in practical applications. To Zoran’s surprise, a nearby library helped him overcome both these challenges. With support from the EIFL Public Library Innovation Programme, Public Library ‘Dušan Matic’ in Cuprija introduced an extramural activity for practical computer coding skills and robotics workshops in the library and at nearby schools. Using robotics kits, children and youth are now building robots, and writing computer programmes to bring them to life. Zoran says that now his students can immediately see how their coding works, and this motivates them to learn more. In future, Zoran plans to liven up exams by testing his students’ practical skills. The library’s project has inspired me to encourage students to try out new ideas and experiment through practical applications using technology. 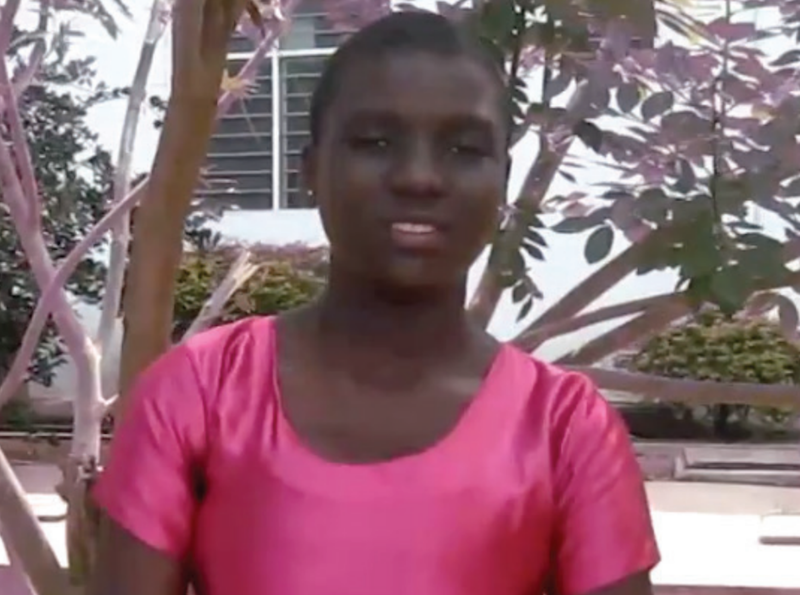 Maude Gati is a 15-year-old student living in the Volta Region of eastern Ghana who dreams of becoming an engineer. To realize her dream she needed to pass the Basic Education Certificate Examination, which determines access to secondary school. Maude feared she would fail because she was getting poor grades in an important subject: information and communication technology (ICT). Like many children in Ghana, Maude attends a school that does not have computers or an internet connection. Without practical experience, she struggled to understand ICT. Her local library offered a solution. With support from the EIFL Public Library Innovation Programme, Volta Regional Library travels to rural schools bringing solar powered laptops and wi-fi internet. Working with teachers, librarians teach the children basic computer and internet search skills. Every week, the library visits six schools, reaching over 600 children. As a result of these classes, Maude passed her exams and is now a student at Mawuko Girls Senior High School. IN 2014: 50% of all public libraries in Ghana, Kenya and Uganda upgraded their staff computer literacy skills through training by EIFL. I would not have passed my Basic Education Certificate Examinations without attending our library’s computer classes. Offering new services for children and youth with support from EIFL. 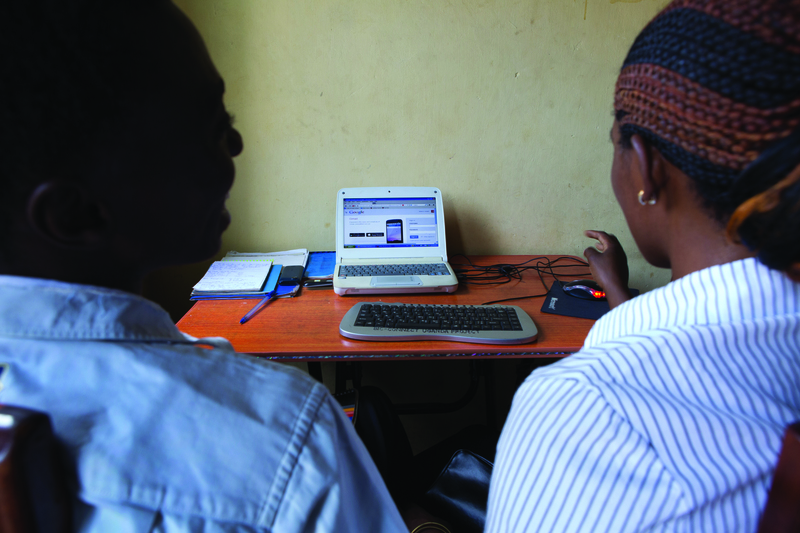 In Ghana, Kenya and Uganda upgraded staff computer and e-literacy skills through EIFL training. Given to reward innovation in 10 public libraries in Africa, Europe and Latin America. 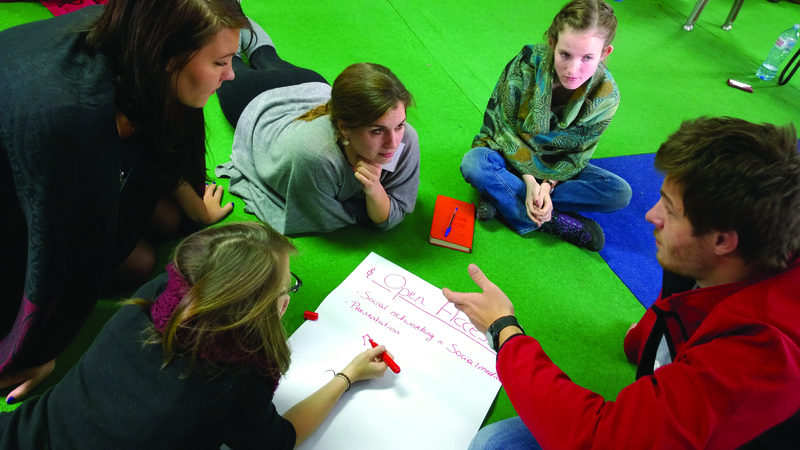 Psychology students are trained on how to foster open science in their daily workflows in Serbia. EIFL led the training as part of the FOSTER (Facilitate European Science Training for European Research) project. In 2014, EIFL organized, supported or took part in 81 events, workshops and conferences about issues that affect access to knowledge. Download them here (Jan -April) and here (May to December). EIFL staff come together in Vilnius, Lithuania. We would also like to thank our talented team of staff, advisory and management board members for their enthusiasm and commitment. 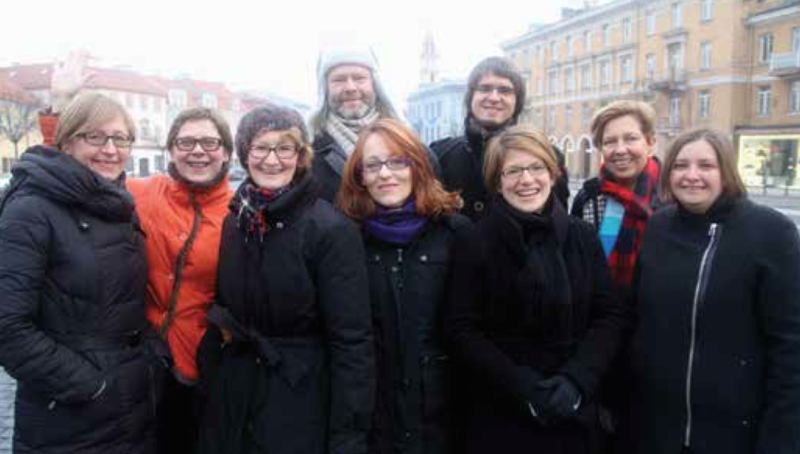 (photo from left - Rima Kuprytė, Ramunė Petuchovaitė, Teresa Hackett, Andrius Kriščiūnas, Carla MacCallum Grazioli, Edvaldas Baltrūnas, Romy Beard, Jean Fairbairn and Iryna Kuchma. Download the financial figures from the last year.